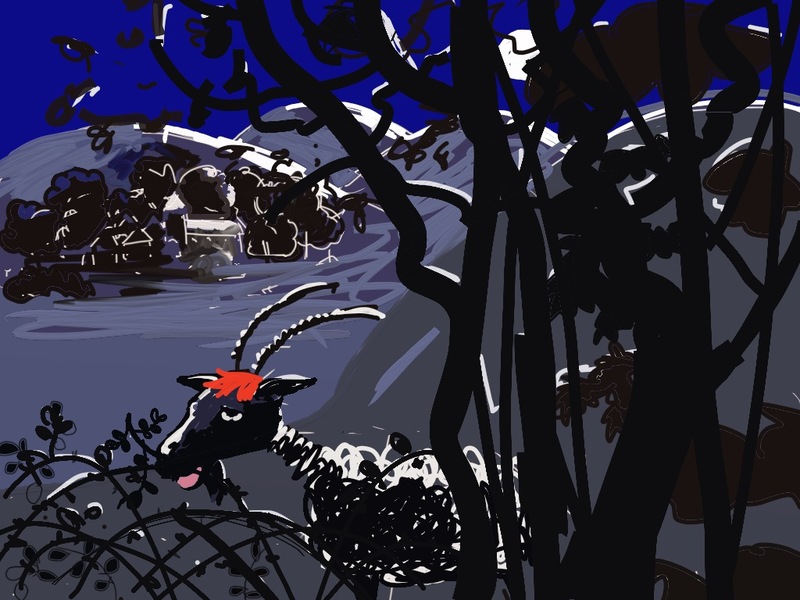 Just to revamp , I left EhBeh contemplating his reflection , in the form of a goat. He confidently sets off , he has 5 hours in which to cover 30 kms, it’s a tall order, and he will have to run swiftly all the way.The elation at his new-found agility is sooned dashed as he enters the deep forest of Liorac. His progress is hampered by thick undergrowth. Strange rustlings,snortings and scutterings of night animals and birds, twigs snapping, leaves rustling, trees creaking and whispering, these sounds fill his terrified ears. He fights through the tangled brambles, he succumbs to an irrational desire to eat, pausing to munch them as he takes stock of his situation; better to follow the paths long trodden by wild animals, than battle aimlessly through the rampant undergrowth. The decision quickly leads him to a moonlit clearing, from which, at last, he can see the dark brooding silhouette of St Georges de Montclar. He breaks free of the forest, racing across the open fields to the village. He reaches his first destination. In the square, the church tower looms high above, the 3 great iron bells hang still, silent and watching, moonlight glinting on the metal. He canters through the narrow sleepy streets, his hooves clop clopping on the damp cobbles, echoing loudly in the silence; only 4 more bells to pass. But….he is triumphant too soon, a dark shadowy figure appears out of the gloom , it threateningly blocks his way. It grabs at his horns as he tries to avoid it, and feels his head whipped to one side as he looses balance and falls to the ground. He scrambles to his feet, bucking and kicking, manages to break free, and heart beating painfully, bleating pitifully, he sallies forth through the slumbering sepulchral streets. Catching his breath, he heads for the next village, across the dimly dark terrain. I have to hurry this along , I will come back to polish up the story later. Synposis: there is more of a scuffle with the shadowy figure. After escaping the village, description of running , getting lost, moon / stars moving indicating time. Meets a she-goat. She shows him quick way to Quessyac, they lope together through the dwellings, past the church. The solitary bell regards the pair. Distracted with her, ( she shows him a prime spot to nibble foliage, losing time). She sticks with him , they race together through the chill night, across the unwelcoming terrain. The hills get higher, deep gorges appear, (description local landscape,) alienating etc. The last three bells seem unattainable, till the bell tower suddenly comes into view on the horizon. The final lap as they realise that he will change form, he leaves TantPis after a heavy-hearted parting, and he races on alone. As he reaches his goal, the sky pales in the east; he looks up to see one bell missing . The local conseil municipal, after many months of meetings and debate, have chosen to replace the huge cracked bell, and there are only 2 bells in the tower. he has only managed to pass 6 bells, the curse is upon him. 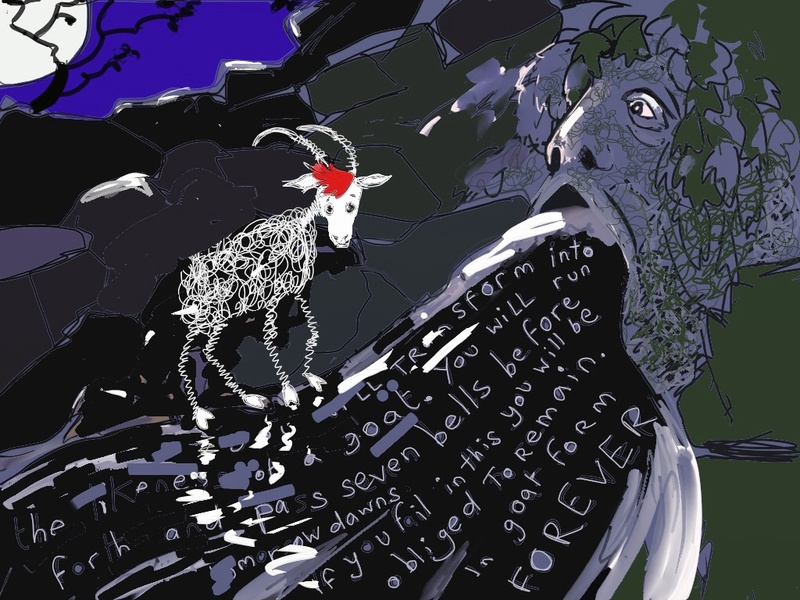 He realises with alarm, he will remain in goat form forever. In despair he collapses in front of the great heavy door of the church. But wait, he hears the distant hooves, the sun begins to rise and the its beams pick out the far-off shape of Tantpis coming to find him. He sighs with relief, for he realises he can spend the rest of his days with her, he turns and heads off to meet her , and take her home , where EhBeh and TantPis ( Ebby and Tanpi) live happily ever after, parenting many many kids, each with a topnotch of red hair. Thus is the source of the name “Place of goats”, La Crabouille. Ah well , so much for keeping the blog visual. The story ran away with me, but it has helped form an image. I started modelling the head this weekend, will post the pics later. Wonderful! I shall never again write the words La Crabouille onto an envelope addressed to you without thinking of this. OK,just got this notification. So things seem to be working after all. Good! Now I know who you are, Ellie, I can bore you to death! Quite fitting when you consider that your user name is after a deceased and forgotten cat! I like it liz But to speak the truth i can’t use the browser or the link to reply on the blog …when will you teach me ? Or give me a little help for this? These are just wonderful , I’m biased as I have a particular goat love, but nonetheless just marvelous . these are really fantastic, i love this storyboard approach, you’ve created a whole world…the mouth of the river is *excellent*!! Thanks Zoe, I dearly want to make a puppet of the fountain, but I think I will be hard pressed to get just the EhBeh puppet finished, as a heap of work has just come in! I will make him eventually though. Hi Zoe, yes it’s tempting to go on and on with this, I still want to finish the storyboard, and I would love to make and paint scenery as well, then I need a theatre for the scenery to go in aaaagh! but I MUST get on with the puppet! Isn’t creating fun?! Aw shucks Fred, you too have a way with words!! I’m glad you let us know how it ended!